What used to be held every four years is now held yearly which is good news as there’s no need to wait for years before the next one comes along. The Imbayah is a prestige feast given by affluent Ifugao people belonging to the elite kadangyan class. 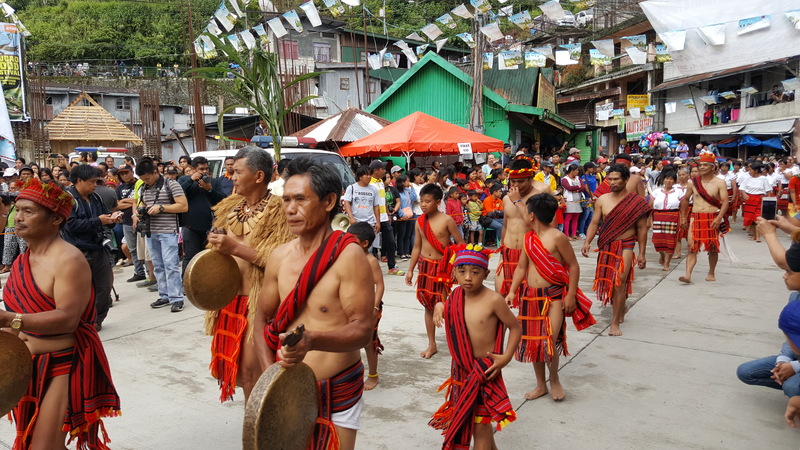 There are village Imbayah feasts but the one held at the last week of April in Banaue has been institutionalized by the local government of Banaue. Lilymae and I arrived Friday morning, a day before the main festivities. Stalls had been set-up at the short road to the municipal hall. At the area fronting the municipal gym, male wood carvers were busy displaying their skill and creativity by carving wooden stools in their own designs. In the evening, we headed to the municipal gym for the Mr. and Ms. Imbayah pre-pageant (what’s a town celebration without a beauty pageant?) 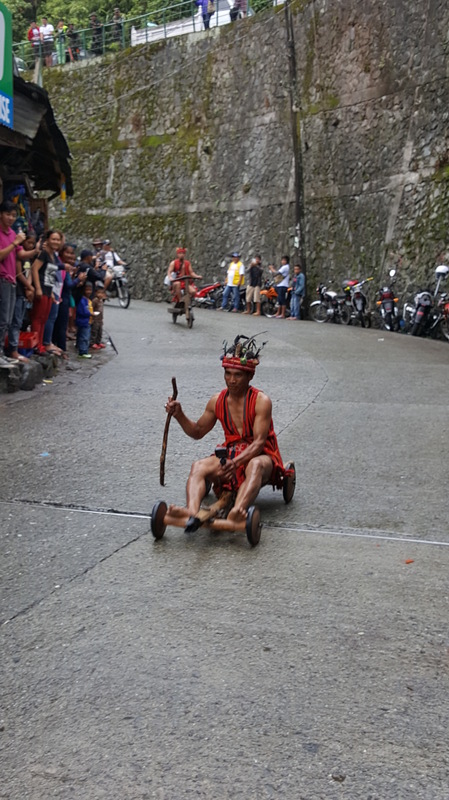 and the Banaue’s Got Talent contest. 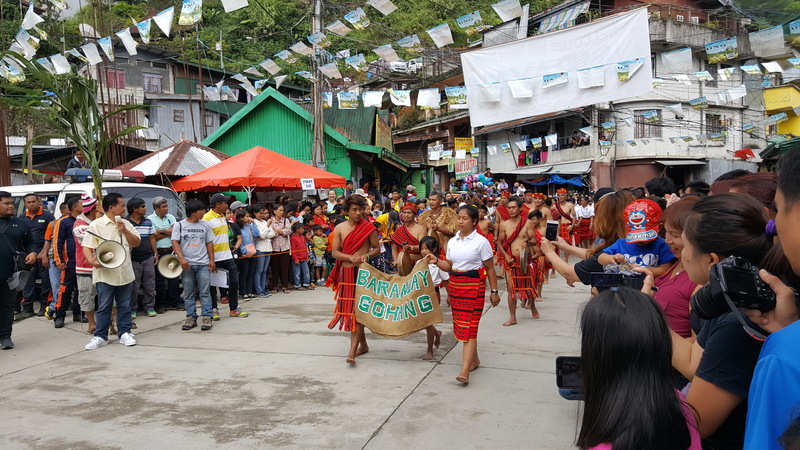 The main event, however, at least for outsiders like me, was the street parade participated in by the different baranggays of Banaue which took place today. The parade started at the Immaculate Conception School grounds and ended at the municipal grounds where the groups danced and re-enacted rituals to large crowds of excited locals, tourists, and special guests. 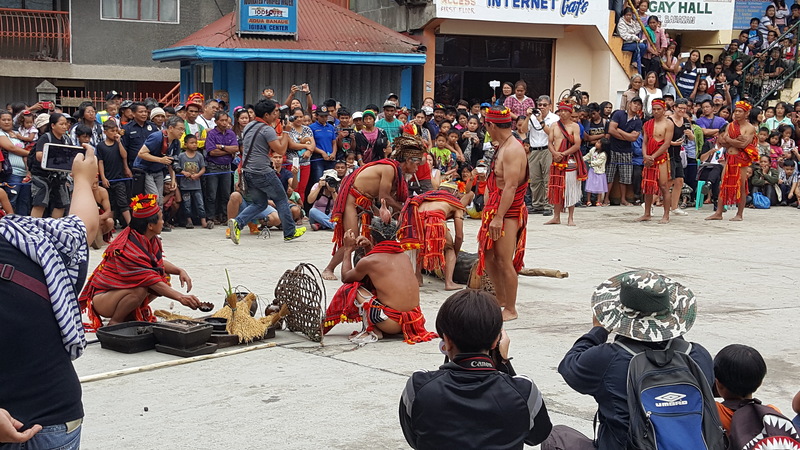 EditBecause animal sacrifice, drinking of wine, and sharing of rice is a common feature in Cordillera rituals, many of the presentations featured these. While other baranggays were content with faux animals, Baranggay San Fernando actually killed a live boar! Of course, there were lots of dancing to the music of the flat gongs (gangha). 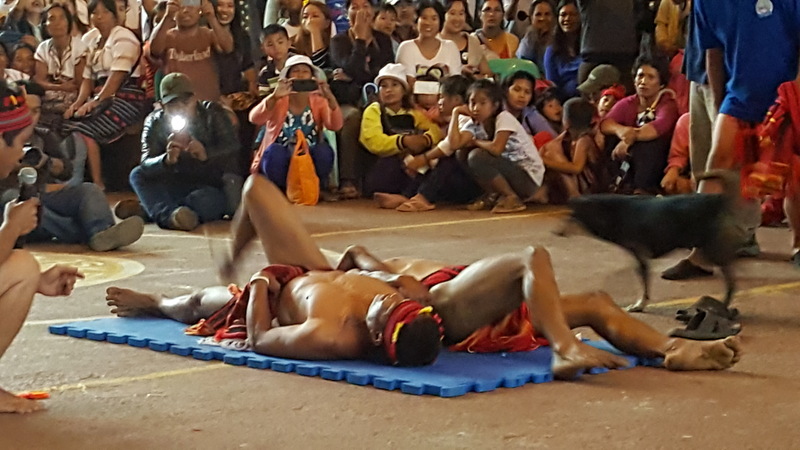 If you’re used to lively street dancing such as you find in the Sinulog, Kaamulan, and other festivals, you might find the presentations at the Imbayah a bit too low-key. However, that’s precisely the charm. There are no hired choreographers to set-up the presentations so you get to watch something that the community themselves created out of their own experiences and knowledge. If I may use the term, it’s a little bit more “authentic” than those highly-choreographed and synchronized extravaganzas. In the afternoon, under a lightly drizzling sky, we stood by the road to see the wooden scooter racers wheez by to the finish line at the plaza. 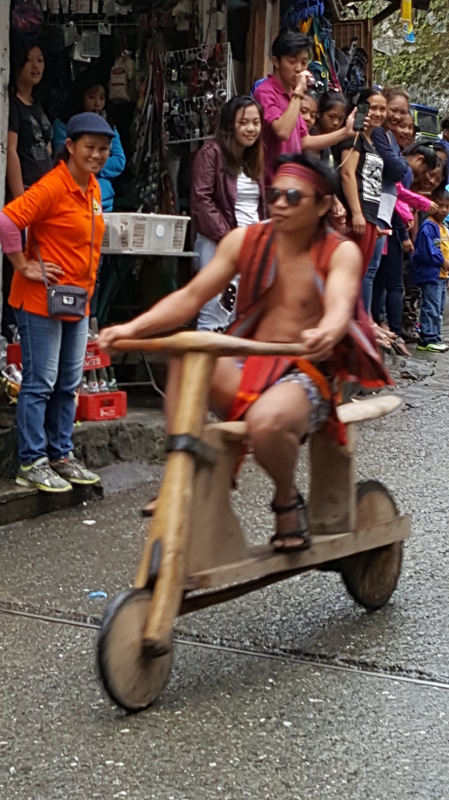 These scooters are 100% handcrafted from wood and display Ifugao ingenue in design and wood carving. This one is really different from the rest. There were also native games for children and adults which were fun to watch mainly because everyone were having some good old fashion fun. I really admired the Ifugao kids’ skill with the top. The one below is a race where women walk with a native basket called laba on top of their heads. The most exciting game though was the leg wrestling. Awesome! This gave me an idea about festivals in the Cordillera Region. I was on the other side of the country on the same weekend. Would be planning my next year for these. Nice article. 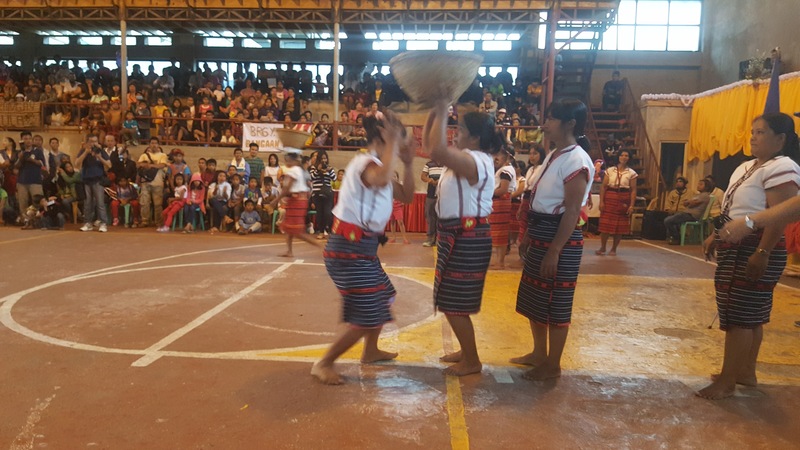 April and May are the best times to go to the Cordillera for festivals. 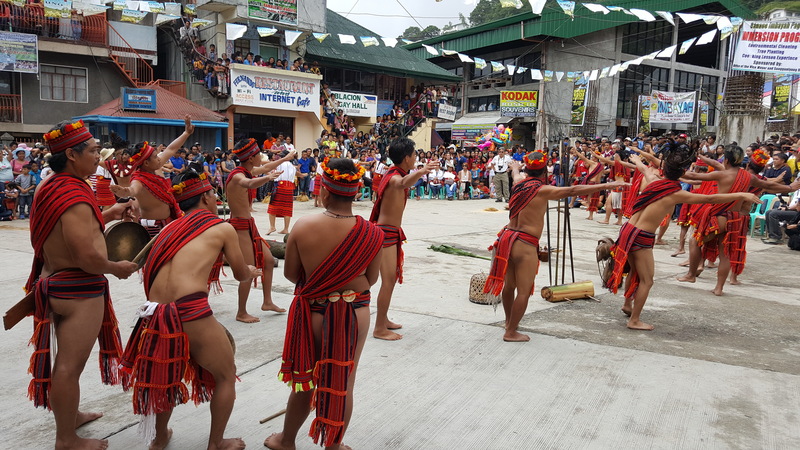 There is one in June, the Gotad ad Ifugao in Lagawe.